The Draft National Civil Aviation Policy (NCAP) 2015 proposes to boost regional connectivity in the country through the implementation of a Regional Connectivity Scheme (RCS). The RCS is aimed at making financially unviable, but economically important flights on certain regional routes a reality. But for this to come true, many moves need to be made. The Ministry claims that there are 476 airstrips / aerodromes / airports in the country. Question is, how many of them are worthy of immediate operation? Today, airlines operate into and out of just 76 airports. What is the condition of the remainder airports? The Ministry, in its bid to promote regional connectivity, must be specific about what it will fund. We touch upon this, and also try to do the numbers about how much money the Ministry may be able to raise, and with that money, how many regional aircraft may be operated. And which aircraft types are the most likely ones for the near term and the long term. The RCS will spell the boom of regional aviation in India, only if implemented right. But it will also tax regular airlines, and not offer any viability gap funding for these airlines. There are challenges, and there are opportunities. To learn more, please click here. 10 year old SpiceJet’s performance in Q4 FY’15 has been promising. SpiceJet as an airline has been promising in certain quarters, profitable in some others, and disappointing in many. One problem that has plagued the airline is impatience. The constant change of top management results in one, big problem: insufficient time for any strategy to bear fruits, no matter how brilliant. That is because any strategy has a trial and error phase – essential to coarse and fine tune the strategy to the environment – both internal and external to the airline. In Q4’FY15, SpiceJet changed hands, yet again. The Marans are out, and Ajay Singh is back in. In the quarter, the aircraft lost a Q400 to an accident at Hubli. Active fleet size was down to 17 Boeing 737s and 13 Q400s – a total of 30 airplanes, down 50% from the days of 57. Things got so complicated at the airline that the one element required to run an airline was missing – Simplicity. The circumstances surrounding the airline, and the situation it was in Q4’FY15 was very different from what was in Q4’FY14. Yet, comparison is worthy to put things in perspective. Q4’FY15 saw SpiceJet as a shrunk airline – lesser routes, smaller fleet, lesser departures. 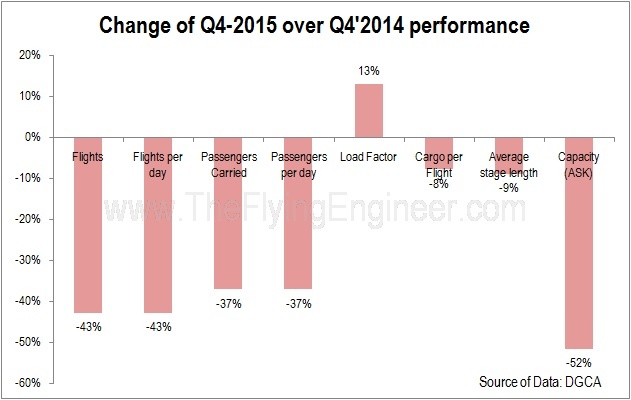 The number of flights were lower by 43%, to an average 179 a day from 312 in Q4’FY14. Load factor difference was a positive by 13% – which meant the airline carried more passengers per flight, on average. This had two effects – the number of passengers carried was down only 37% despite 43% lesser flights. This also affected the cargo uplift, which was down 8% due to lesser free cargo space available. The average flight length was 752 km – down 9% from 826km. Capacity was down 52%. SpiceJet is yet to stabilise its operations. An airline has two aims: safe and convenient flights for passengers, and value for shareholders. Part of convenience are frequency and on time performance, with the latter more important. SpiceJet’s on time performance isn’t one of the best, and that is something that the airline needs to, and perhaps is, working on. SpiceJet has had the highest number of cancellations among all airlines in the month of January and March, and the second highest among established airlines in the month fo February. Stabilisation of such operational parameters is key to SpiceJet becoming a preferred airline. Unit revenues speak volumes about an airline’s efficiency. We look only into Income from operations (Net sales), and ignore all other incomes, as this is the real measure of the airline’s core activity’s performance. Q4’15 had a revenue of INR 4.15/seat-km (or per ASK= RASK), which is 3% higher than what was realised last year. This shows that the increase in load factors had a positive impact on unit revenues, thanks to the strategies employed by the former CCO Kaneswaran Avili and the VP Revenue Management Fares Kilpady. This also reflects network rationalisation. When an airline shrinks, costs get complicated. There are certain costs that are hard to shrink, such as employee costs, as layoffs are subject to an airline’s culture. Employee costs per ASK shot up 63% to INR 0.57/seat-km. Further, staff salaries were upward revised after Q4’14. Although the airline shrunk its fleet, it were the leased Boeing 737s that moved out, not the owned Q400s. Capacity dropped, but the depreciation and amortisation costs associated with the aircraft didn’t. This resulted in the associated costs rising by 48% to INR 0.16/seat-km. Airport charges went up by 18%, in part due to the reduced flight lengths, which means the airline had more take off and landings for the same capacity. This may have also negatively impacted aircraft maintenance. Spares pool policy may have also had an impact. If an aircraft went for a C-check in this period, costs may have been impacted too. Maintenance costs per ASK went up 3%. Other operating costs went up 17% to INR 0.16/seat-km. Other expenses, which includes administrative expenses went down by 5%. Lease rentals per unit went down 18% to INR 0.61/seat-km, owing to higher utilisation of aircraft which diluted this fixed cost. Aircraft fuel costs went down 31% to INR 1.52/seat-km largely due to the fall of ATF prices. Fuel, Maintenance, Staff, Lease and amortisation (as Q400s are owned, and is the equivalent of lease costs) and other operating expenses form a chunk of the expenses, and these 5 together account for 92% of expenses. These costs together went down by 12% to INR 3.62/seat-km in Q4’15 against INR 4.13/seat-km in Q4’14. Redelivery expenses are one-off expenses and went up 626% to INR 0.35/seat-km. Other expenses are arguably not part of the operating expense consideration set. With this, the operational cost per available seat kilometre (which excludes one-off redelivery costs and administrative ‘other expenses’) is INR 3.98/seat-km, which is 10% lower than the INR 4.44/seat-km in Q4’14. With an operational RASK of INR 4.15/seat-km, and an arguable operational CASK of INR 3.98/seat-km, the airline was arguably operationally profitable by INR 0.16/seat-km. Core operating costs and revenues are stressed upon as this is a reflection of the performance and efficiency of an airline’s core activity. However, an airline will need to be efficient throughout the structure. SpiceJet realised a loss of INR 102 Cr due to the total operating RASK and total operating CASK amounting to INR 4.15/seat-km and INR 4.71/seat-km, respectively. Insurance companies paid INR 161 Cr for the Q400 that was written off after an accident at Hubli, Karnataka. SpiceJet received INR 61 Cr. This, along with other income of 91 Cr added INR 153 Cr to the books. Finance costs drained INR 28 Cr. Overall operating loss drained INR 102 Cr. The airline realised a net profit of INR 22 Cr, and the insurance pay off was responsible for the tip over into the black. While a comparison between a small start-up airline and a larger, older airline is fair to neither airline, a comparison will help show what’s possible. Unit costs (per seat-km) of staff is leaner at SpiceJet as it is a larger airline, however, this can fall further. SpiceJet cannot escape amortisation & depreciation costs as Q400s are owned, while AirAsia only leases airplanes. 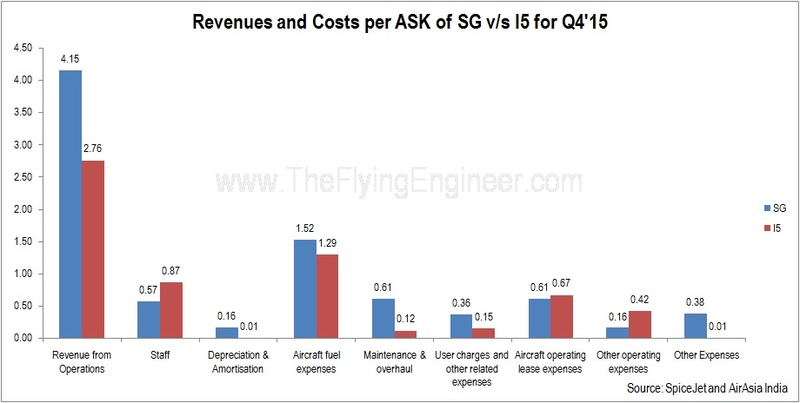 Fuel expenses per ASK are higher at SpiceJet due to the higher fuel burn per ASK of the Q400, the possibility of higher burns due to ATC congestion at metros, and higher load factors. All of AirAsia’s airplanes in Q4 were new, and almost fresh out of maintenance when delivered, needing hardly any maintenance. Such may not have been the case at SpiceJet, which could have taken up the maintenance cost up. User charges are higher at SpiceJet as AirAsia India does enjoy certain benefits from Bangalore airport – the only airport it used to fly into in Q4. SpiceJet flew into all metros. Aircraft operating lease expenses appear lower at SpiceJet as of the 30 aircraft in the fleet, only 17 were leased. Q400’s lease costs do not figure in the lease expenses. Other operating expenses are lower at SpiceJet due to a larger fleet diluting costs. However, ‘other operating costs’ for SpiceJet may not be the same as AirAsia India’s. Where SpiceJet can trim its cost are in the ‘other expenses’. However, AirAsia India has lower administrative costs as many resources are shared with the AirAsia Group. The cost structure (see pie charts) of both airlines show the cost structure for both airlines. Generally, a cost structure which has a larger share of fuel cost indicates a leaner structure. What the management did in FY 2014-2015 to SpiceJet has been impressive – revenue management and market stimulation has resulted in a positive impact on unit revenues even with higher load factors and promotional fares. Such practice, if continued, may benefit the airline in the current fiscal. The airline scaled up its fleet in Q1’16 temporarily through the wet-lease of 3 Boeing 737s. Unverified information point to 2 additional Q400s joining the fleet, and an active evaluation of wet-leasing Airbus A320 aircraft. Whatever the aircraft type, and however questionable it may be, the airline is going to, and needs to increase its fleet size. SpiceJet has another opportunity to keep the system lean as it regrows. Good contracts, scaling up and high asset utilisation will reduce fixed costs. Good market study, prudent and well researched network growth, leveraging the benefits of the Q400 to do what the market leader cannot, and differentiation of in-flight services can allow SpiceJet to realise good unit revenues even in the light of competition. Revenues aren’t much of a problem at SpiceJet, but can be bettered through better core service – frequency and on time performance. Costs are the biggest problem in the airline, and will need to be trimmed down significantly. SpiceJet has what it takes to grow to an extent that allows it to compete non-head-on and healthily with the market leader. Focus on basics and differentiation are key.